Engagement rings have experienced a long history of design and beauty that is only built upon today. 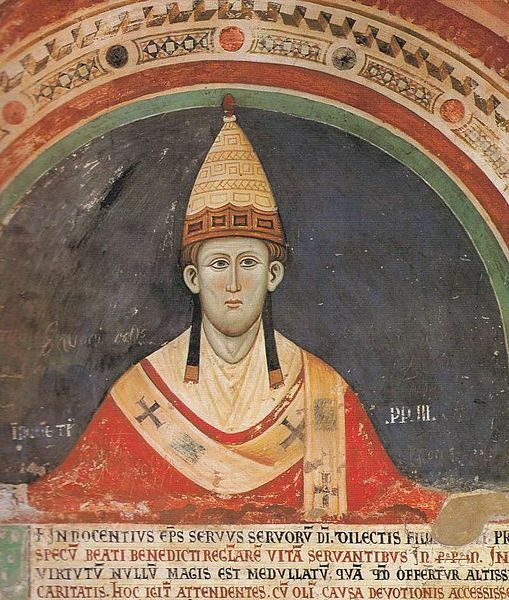 Pope Innocent III was responsible for mandating a period of engagement before marriage. The word “betrothed” comes from the Anglo-Saxon word “troweth,” which means truth. In medieval England, a betrothed couple shared a “truth” or “pledge” to marry, and a ring served as the outward sign that a woman was promised to another. The majority of the betrothal and wedding rings used in the distant past were composed of simple bands. Although we know that some wedding rings in the Middle Ages contained gemstones, many can’t be positively identified as true betrothal or espousal rings unless they contain an inscription or are otherwise identified as such. Some of these gemstone rings resemble our modern day engagement rings and others do not. 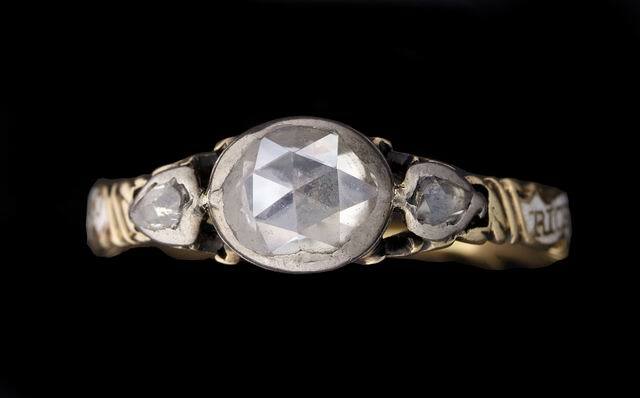 Sapphires, rubies, emeralds, and diamonds were all used in these early tokens of love. 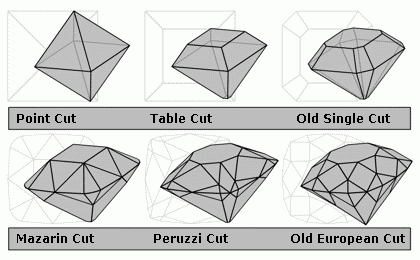 The evolution of diamond cuts shown through drawings. Although diamonds were used in rings for many centuries, some experts date the origin of the diamond engagement ring to the 15th century based on our knowledge of The First Diamond Betrothal Ring and The Smallest Diamond Betrothal Ring. 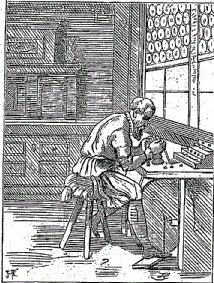 This also coincides with the time that new techniques for cutting diamonds were developed, producing the first table cuts. A Georgian rose cut diamond ring. By the end of the 19th century, the popular symbolic and sentimental rings of the day were replaced by engagement rings very similar to those we know today. Set with a pearl or the best stone the groom could afford, they signaled the couple’s intent to marry after a period of engagement. At the wedding, the couple substituted simple bands inscribed with their initials and the date of the ceremony. 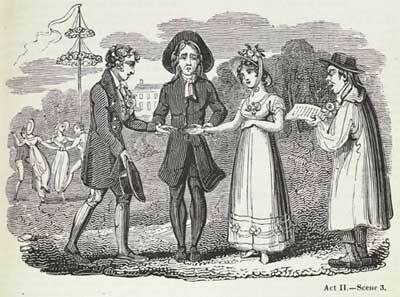 A drawing depicting a traditional marriage ceremony, circa 1825. 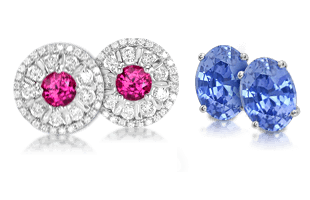 Although the discovery of large diamond deposits in Brazil and South Africa in the 18th and 19th centuries helped fuel the popularity of diamond engagement rings, many of the most affluent actually preferred colored gemstones such as ruby and sapphire. The diamond engagement ring did not become the standard until after an extensive marketing campaign by De Beers in the middle of the 20th century, which used the phrase, “A Diamond is Forever.” The De Beers campaign was intended to bolster the price and public interest of diamonds at a time when large quantities were flooding the market. A 1981 portrait of Prince Charles and Diana Spencer wearing her sapphire engagement ring. Because the 20th century was overwhelmingly dominated by the diamond, a growing number of couples have decided that the diamond solitaire is old news. Today, many couples are selecting antique or vintage style engagement rings with colored gemstones. Two of the most popular styles include Edwardian and Art Deco styles. An Edwardian style blue sapphire engagement ring. 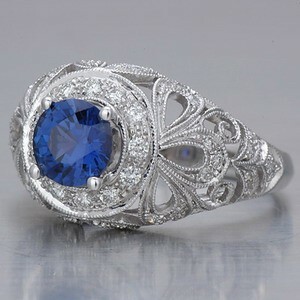 Edwardian engagement rings often feature platinum, diamonds, and sapphires. Jewels of this period (circa 1901-1920) are characterized by filigree, lacy and pierced shapes, milgraining, and scrollwork. Art Deco engagement rings, many in rose gold, sport a streamlined geometric look and multicolored stones. Many of the jewels of this period (circa 1925-1935) use Egyptian, Asian, and Native American motifs. 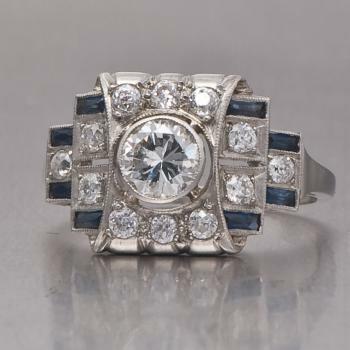 An Art Deco style diamond and blue sapphire engagement ring. Today, in the Western hemisphere, proposals of marriage traditionally include the gift of an engagement ring. In fact, 75 percent of all first-time brides receive engagement rings. According to De Beers, 93 percent of all engagement rings purchased in the U.S. are diamond-only rings, and in the U.K., the percentage is closer to 97 percent. Colored diamonds are currently a favorite for engagement rings. According to tradition, if the woman accepts the proposal, she will wear the ring throughout the period of engagement as a signal that she has already pledged her love to another. The engagement period is on average 16 months, owing to the complexity and expense of many of today’s weddings. 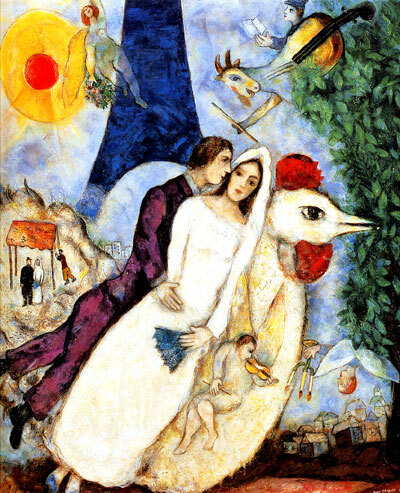 The painting “Bride & Groom of The Eiffel Tower” by Marc Chagall, 1939. The custom of presenting an engagement ring is now becoming popular in other parts of the world, notably India, Japan, and China. Japan is an interesting case in point. Until 1959, diamonds were not even permitted into the country; by 1972, 27 percent of all women received a diamond engagement ring; and by 1981, the percentage had risen to 60 percent. Today, Japan is second only to the U.S. in the sale of diamond engagement rings. In Egypt, Brazil, and many European countries, both the man and the woman typically wear engagement rings, but they are usually matching bands made of precious metals. In these countries, the man’s engagement ring eventually serves as his wedding ring. Engagement rings can come in many styles and designs. In some countries, wedding bands also serve as engagement rings. Today, the classical styling of the solitaire engagement ring is very popular, as are trilogy rings, also known as three-stone rings. For brides with an interest in past traditions, vintage rings with an Edwardian or Art Deco style, are also very popular. A 6-prong diamond solitaire engagement ring. 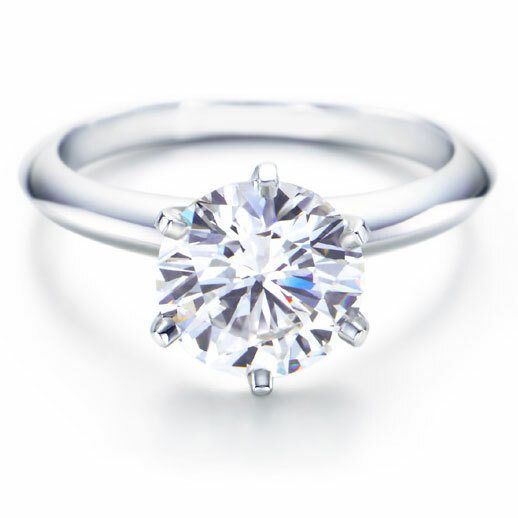 Sometimes solitaire rings are worn with what are known as ring jackets, ring guards, or ring wraps. These are jewelry elements designed to fit over the band of solitaire engagement rings to both protect and further enhance the solitaire itself. Diamonds are indisputably the most popular stones for engagement rings, but they are not the only option. Rubies, sapphires, and emeralds were preferred in the past and today we are witnessing an increase in their popularity once again. 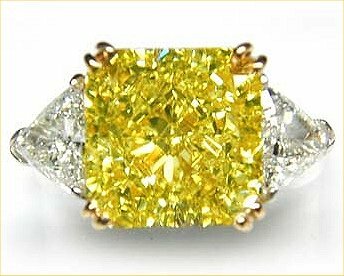 If a colored gemstone forms the centerpiece for an engagement ring, diamond accent stones are frequently included in the design. Couples may also opt for birthstones or other symbolic gems to make the ring more personal and significant. 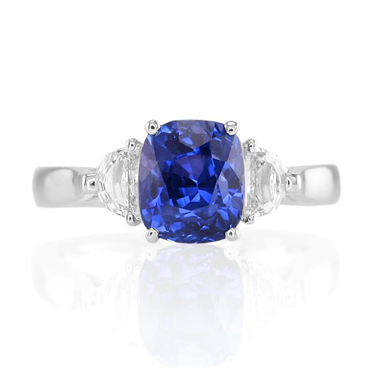 A blue sapphire and diamond three-stone engagement ring. 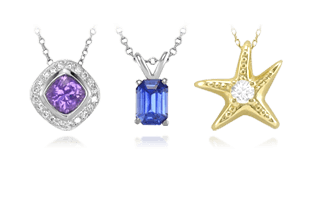 White gold, yellow gold, rose gold, and platinum are frequently used to mount gemstones. 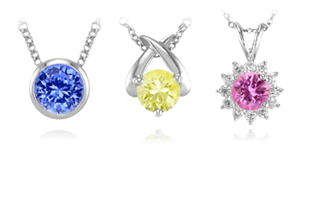 Depending on the color of the gemstone, or the personal taste of the bride, couples can choose a metal color that will make for a flattering combination. Jewelers are continually experimenting with new gold alloys, including green and blue gold—which are nice companions for many gemstones. Of the metals regularly used in jewelry, platinum is the most valuable. 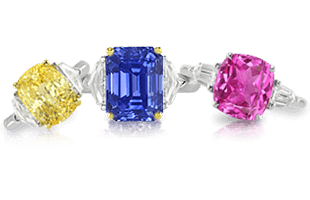 Most fine gemstones look magnificent in a platinum setting, which makes blue and green colors look cool, and yellow and red colors look crisp and highly saturated. Palladium is a good alternative for platinum or gold, as it is less expensive. Now that engagement rings have been covered, we well next explore the history and culture of Wedding Bands | A Guide to History and Style.